Folly is an installation by Beth Katleman, that’s debuting this week at the Greenwich House. 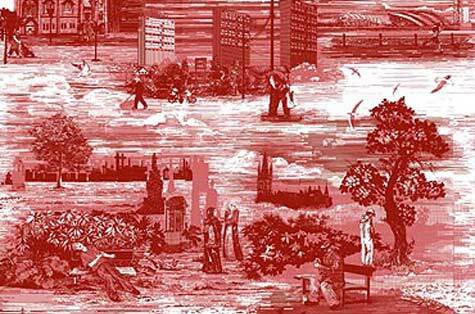 The project is a kind of three-dimensional toile wallpaper, whose pastoral vignettes contain some surprising, even sinister, elements. Town Toiles has a line of contemporary toiles of different US cities, plus soft goods like tea towels, aprons, totes, and apparel, and also wallpaper. I’ve mentioned my love of toile before and, on Dita Von Teese, it is the height of ferocity. Image by JPI Studios via Perez Hilton. 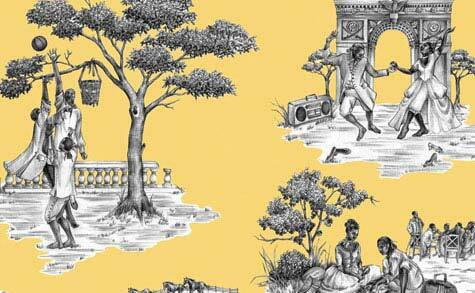 The Harlem toile by Sheila Bridges is available via Studio Printworks. 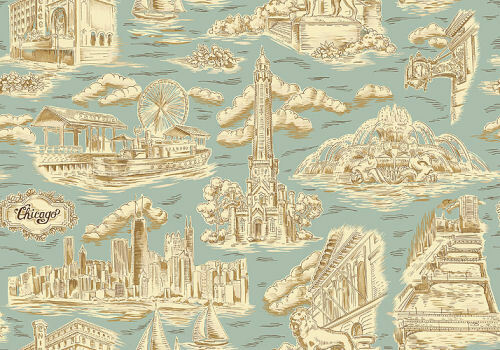 Scottish firm Timorous Beasties has created some amazing wallpapers and textiles, including toile patterns of Glasgow [pictured] and London.